Marc-André Dorion, an All-Canadian with the McGill University men’s hockey team, has been invited by the Toronto Maple Leafs to attend their upcoming prospects camp, scheduled for July 3-10 in Toronto. It will be the second National Hockey League tryout for Dorion, a 5-foot-11, 188-pound native of St. Hubert, Que., who was named as the most outstanding defenceman in Canadian university men’s hockey last season and attended the Dallas Stars rookie camp in 2008. Scouts from the Maple Leafs attended a number of McGill games during the 2009-10 campaign, including the 2010 CIS national championship tournament in Thunder Bay, Ont. Dorion was the top-scoring blueliner in the Ontario University Athletics conference during the 2009-10 schedule and ranked third among all CIS rearguards with 36 points, including seven goals, in 25 regular season games. Overall, he had a 12-14-26 record with 36 penalty minutes in 42 contests. 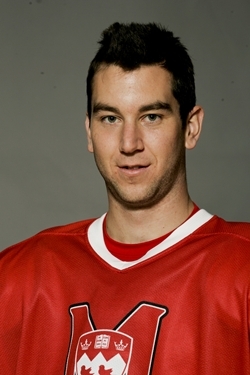 McGill, which posted a 22-6-0 record en route to winning the 2010 Queen’s Cup as OUA champions, has produced 10 players who have skated in the NHL, including Mathieu Darche, currently with the Montreal Canadiens. Four other former Redmen players, including Mike Babcock (Detroit) and Jamie Kompon (Los Angeles) are currently coaching in the NHL.